You read correctly. Bacon. Caramel. Apple. Pie. I’m not a very big pie fan, but this pie…THIS PIE. It is the best pie ever. I have made it three times, and it just keeps getting better every time I make it. I subscribed to this awesome Youtube channel called Food Wishes. I want to make everything Chef John makes. 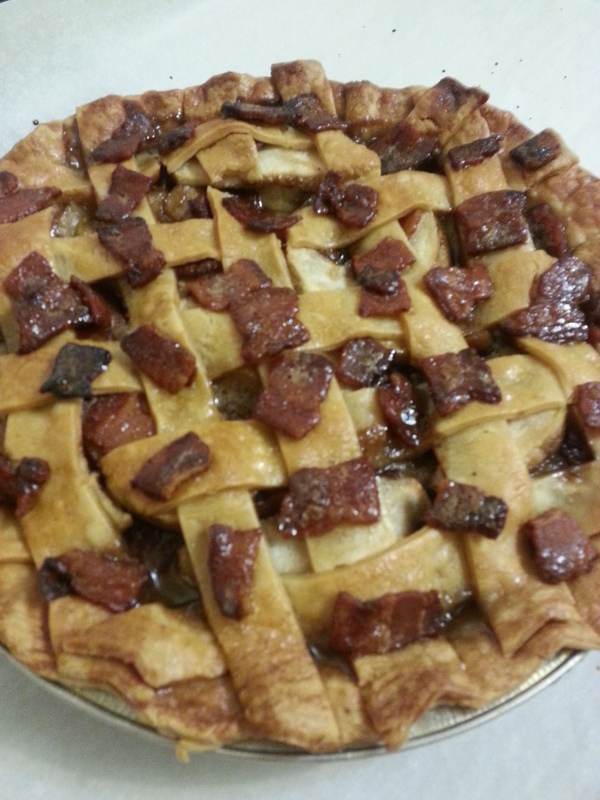 I haven’t made everything, but I sure did make his Caramel Apple Pie. I added the bacon to it. I used his recipe pretty much exactly except for the bacon and extra spice in the caramel sauce. Here is his blog post about the pie. I will also have his video linked at the bottom of this page. Cut your bacon into nice bit size pieces, and cook until crispy. When done put the bacon on plate lined with paper towels. As that is cooking, line your pie pan with the crust. You can trim off the excess crust if you like. 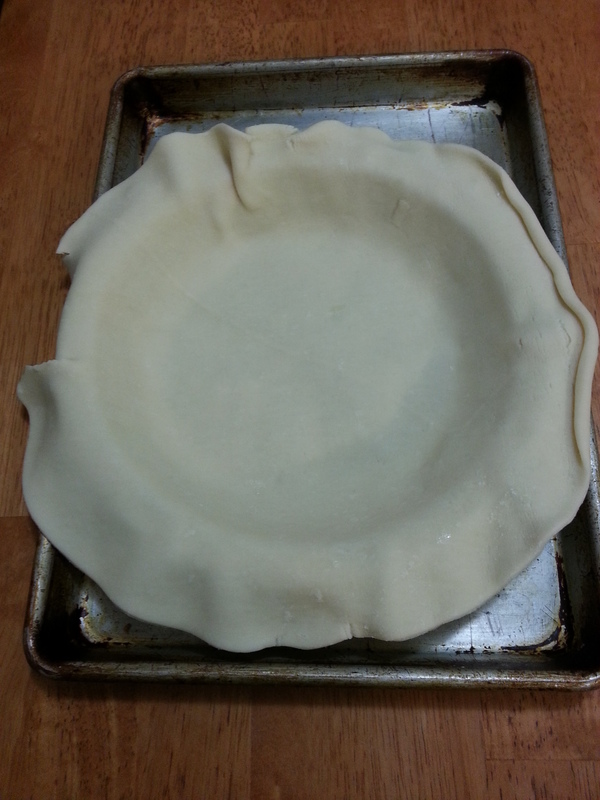 Also, put your pie pan on a baking sheet and line it with parchment paper. I did a lattice design, so I went ahead and cut my crust into strips. Slice up your apples. I only used two apples because my pie pan isn’t that deep. I took the skin off, but you can keep it on. Up to you. For the caramel sauce, turn your burner on to a medium heat. Add your sugar, brown sugar, water, butter, cinnamon, and nutmeg to a sauce pan. Let it all melt and come to a boil. I let it boil for about 30 seconds. Then turn off the burner. Now you can start assembling your pie. Before you start though, reserve some of the bacon on the side. 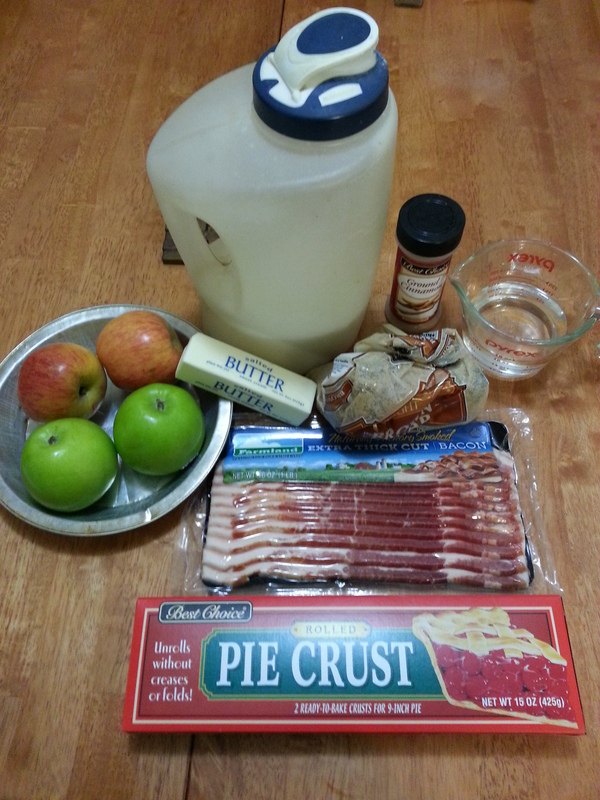 Now, I start off by putting some pieces of the (unreserved) bacon on the bottom of the crust. 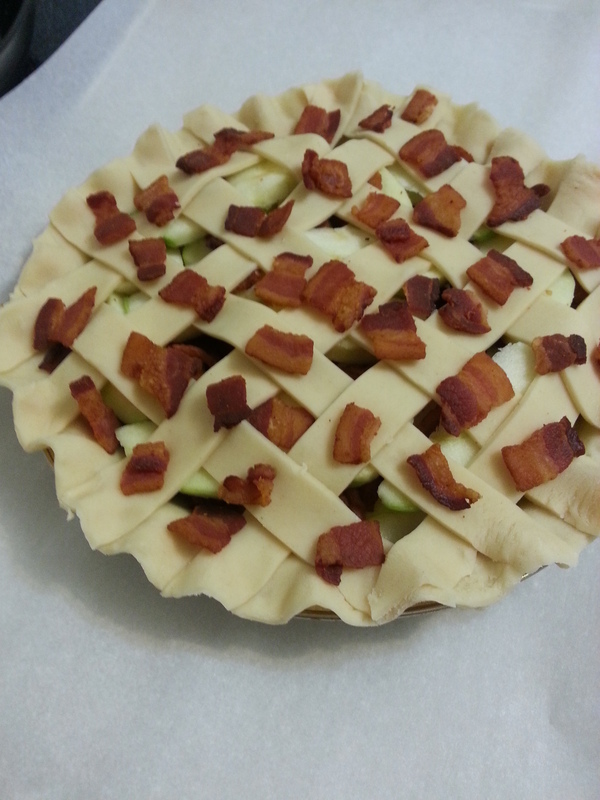 I put a layer of apple on top of that, and then a layer of bacon. I repeat that about 2 more times depending on how much apple you have. Use the strips of pie crust to create a lattice design. You don’t have to do this, but it makes it pretty. 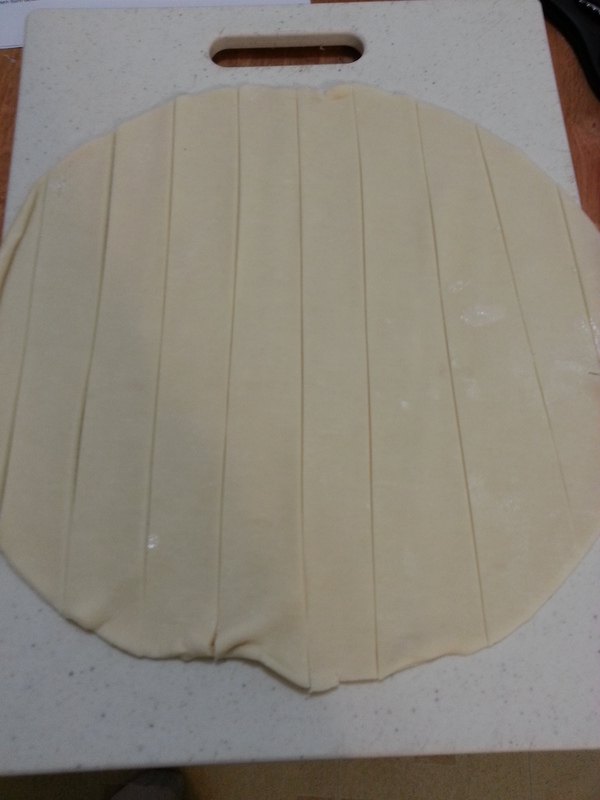 I put down about 4 or 5 strips on the pie, fold back every other one, and add the other strips. Then fold those over, and fold back other strips. Just continue motion. 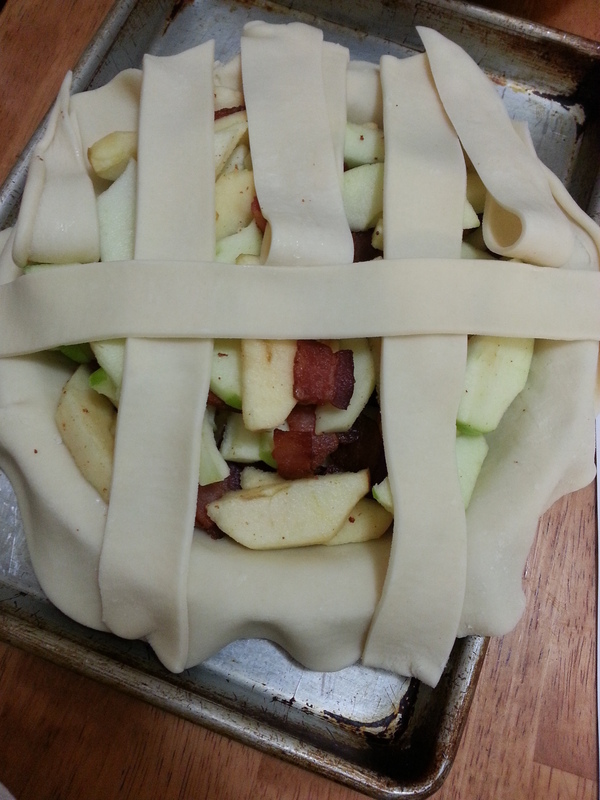 When that is completed, take the reserved bacon, and add it to the top of the lattice. Grab the caramel sauce you made, and now spoon it all over top of the pie. Make sure the entire crust is covered. Get the sauce inside the holes. You will think you made too much sauce, but you didn’t. Use ever last drop. Doing this makes the crust incredibly crispy and candies the bacon. It’s the best part of the pie! Bake the pie for 15 minutes at 425 degrees. This helps start the caramelzation of the crust. After the 15 minutes, turn your oven down to 350 for 30-40 minutes. That may look burnt, but it is not! It is perfect! If you get nervous that your edge might get burnt, you can cover it with aluminum foil. Let this cool completely before cutting into it. After the first piece is cut, I like to “drain” the pie. The juices from the apples pour out a little. Once those juices are out, I feel like the pie completely sets up. I hope you all enjoy this pie. I’m telling ya. So good. 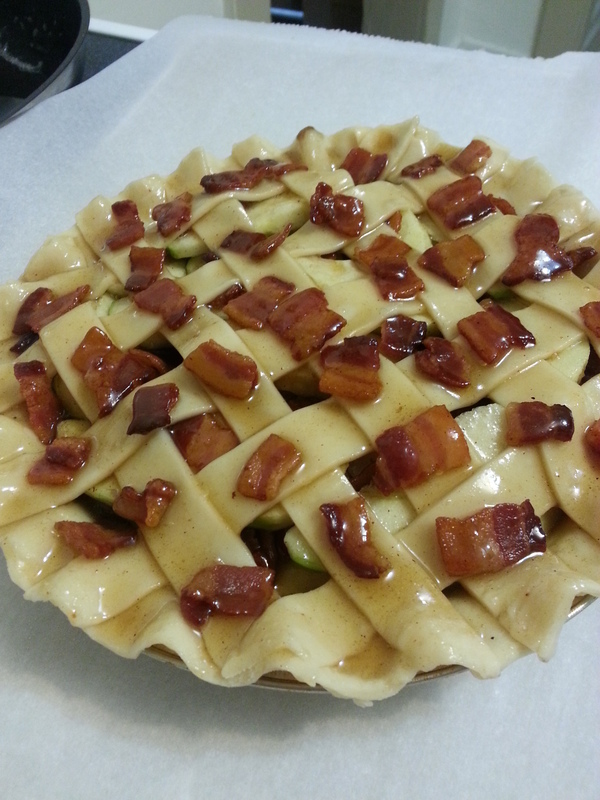 This entry was posted in Food and tagged apple pie, apple pie recipe, bacon, bacon apple pie, bacon apple pie recipe, bacon caramel apple pie, bacon pie, bacon pie recipe, bacon recipe, baking, caramel, caramel apple pie, caramel sauce, cooking, dessert, easy recipe, food, food wishes, food wishes recipe, nood mood, pie, sweets. Bookmark the permalink.